Rashes, bumps, redness and itching—although these generic skin symptoms seem similar, they actually mean you may have one of a number of different conditions, including rosacea, psoriasis, and eczema. While rosacea, psoriasis, and eczema tend to be chronic conditions, they're rarely life-threatening. However, they can lead to complications (some of which may be severe) if left untreated. This is why it's important to see a doctor for a proper diagnosis and treatment plan. On the same token, taking the time to learn about your skin condition (or potential condition) is a perfect first step. With that, here's a primer to help you sort out the differences among these three oftentimes confusing skin problems. Rosacea is more common among those who are fair-skinned, and it strikes about three times as many women as men. This is believed to be due to hormonal issues, particularly those that occur around the time of menopause. Even so, rosacea can develop at any age, even during childhood. Rosacea occurs primarily on your face and causes symptoms like easy and severe blushing or flushing, hotness, redness, bumps, and swelling. These symptoms often come and go, with periods of time when they are more severe and times when they are milder. In addition, the symptoms of rosacea typically follow a pattern. Initially, the central areas of the face are affected, with the flush spreading over time to the cheeks, forehead, chin, and nose. Rosacea can even spread to include the eyes, ears, chest, and back. With the areas of redness on the face, tiny blood vessels, pimples, and/or pustules crop up, but no blackheads appear, which can help distinguish rosacea from acne. Over time with rosacea, the blood vessels on a person's face become enlarged, making the redness a more visible, albeit harmless, condition. It's worthy to note that about half of people with rosacea develop a problem called ocular rosacea, in which the eyes sting, burn and feel gritty. Left untreated, eye infections can lead to problems with vision. Lastly, rosacea may lead eventually lead to rhinophyma (a term used to describe the enlargement of the oil glands in the face which causes swollen red cheeks and a large red nose). Rhinophyma tends to strike men who have had rosacea for years and may become disfiguring enough to require surgery. Although rhinophyma with a swollen, red nose is not a sign of alcoholism, cartoon stereotypes have unfairly led people to believe that's what it is. A variety of topical treatments may be helpful to treat rosacea, including antibiotics, antifungal medicines, benzoyl peroxide, and vitamin A creams (retinoids). It's important to note that steroid creams should only be used for short bursts (no more than two weeks at a time) to decrease redness. In fact, steroids can actually worsen rosacea if used incorrectly, and they may lead to other adverse effects. Another treatment for rosacea is laser treatment or a treatment called electrodesiccation (use of a tiny needle that delivers electricity to the blood vessel, destroying it). Lastly, blood pressure medications like beta-blockers or Catapres (clonidine) are sometimes helpful to treat the flushing associated with rosacea. Psoriasis can develop at any age, even during childhood. It tends to run in families and waxes and wanes in severity over the course of a lifetime. When you have psoriasis, your immune system treats your skin like a foreign invader, attacking and damaging it. The most common form of psoriasis is called plaque psoriasis, in which areas of the skin become covered by thick, red patches (the so-called plaques), topped by a silvery-white scale. Plaque psoriasis can occur anywhere on the skin but usually affects the elbows, knees, and scalp. The areas where plaques form can be itchy and tender. Plaque psoriasis can also affect the scalp causing it to become very scaly, resembling dandruff. Nails too may be targeted and if so, become pitted, ridged, and loose. Guttate psoriasis: This type of psoriasis causes small, tear-drop shaped, salmon pink spots to appear. The spots form most often on the trunk, arms, and legs, but can also cover the entire body. Pustular psoriasis: With this type of psoriasis, a person develops inflamed, red skin covered with pus-filled bumps, often found on the palms of their hands and soles of their feet. Inverse psoriasis: Like the name, this type of psoriasis causes lesions that are not scaly but smooth, red, and shiny. The areas of skin affected by inverse psoriasis are usually skin folds like armpits, under the breasts, and/or the groin area. Erythrodermic psoriasis: This is a rare, potentially severe form of psoriasis that causing widespread redness, swelling and itching all over the body. In extreme cases, complications like overwhelming infection, dehydration, and congestive heart failure may cause this condition to become life-threatening. Finally, a potentially debilitating complication that develops in about 10 to 30 percent of people with psoriasis is a form of arthritis called psoriatic arthritis. While this joint condition affects people uniquely, a few classic symptoms include prolonged morning stiffness, fatigue, and sausage-shaped fingers and/or toes (called dactylitis). You may be surprised to learn that infections are frequent triggers of psoriasis flares, especially strep infections, which are highly correlated with guttate psoriasis. A variety of topical treatments may help improve symptoms of psoriasis, including steroid preparations, anthralin, Dovonex (calcipotriene), vitamin A creams, and coal tar-containing preparations. Exposure to ultraviolet (UV) light may improve symptoms, whether it's natural, outdoor sunlight, or a special lamp/light in a doctor's office. 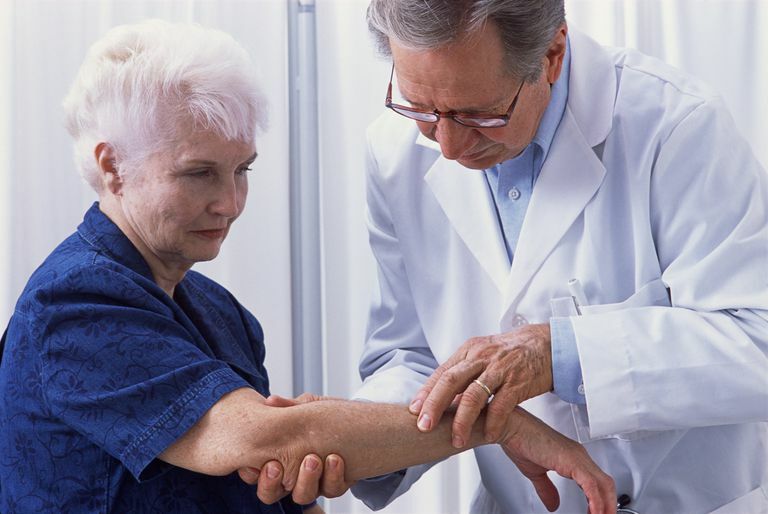 Severe psoriasis may require treatment with powerful medications that suppress your immune system, such as Trexall (methotrexate), Sandimmune (cyclosporine), and biologic drugs including Enbrel (etanercept), Remicade (infliximab), or Humira (adalimumab). Eczema (also known as atopic dermatitis) can develop at any age, even during infancy. It usually begins before age 5. About 40 percent of children "grow out" of their eczema, but others experience flare-ups throughout their lives. Eczema tends to run in families, especially those prone to allergies and asthma. Eczema is believed to be an allergic reaction that evolves into a cycle of redness, itching and more redness and itching, as the scratching and rubbing only aggravate the skin further. Affected areas may become cracked, discolored, blistered, crusty or scaly, and may weep a clear fluid. People with eczema are at an increased risk for developing skin infections, especially with the bacteria, Staphylococcus aureus. Eczema can crop up anywhere, although common areas are in skin folds, on cheeks and on the backs of the hands, tops of the arms and front of the legs. Triggers for eczema include temperature changes, dry skin, irritants (for example, wool, dyes, cosmetics, perfumes, and soaps) and foods, especially the major allergens: eggs, peanuts, fish, soy, wheat, and dairy. Stress, dust mites, pollen, and animal dander also can trigger eczema. When you have eczema, it's important to keep your skin clean and well-moisturized. Topical steroids can improve redness and itching. In addition, prescription topical medications like Elidel (pimecrolimus) and Protopic (tacrolimus) can improve itching and redness, but should only be used for short periods of time. Lastly, oral antihistamines may soothe itching. In severe cases of eczema, oral steroids, Trexall (methotrexate), Sandimmune (cyclosporine), or Imuran (azathioprine) might be needed. Another important component of eczema skin care is to take short, warm (not hot) showers and to use a non-soap cleanser. Applying a moisturizer to the entire body within three minutes of getting out of the shower is also key to protecting your skin barrier. Rosacea, psoriasis, and eczema are three common skin problems with some shared and some unique symptoms, triggers, and treatments. Even so, be sure to see your doctor for a diagnosis, as there are actually a lot more skin conditions that may mimic the ones mentioned here. Remember too, your skin is an organ, just like your heart and your lungs, so give it the attention it deserves. A few tips to get you started include: applying sunscreen every day before going outside, avoiding smoking, performing skin self-exams, and seeing your dermatologist if you notice something worrisome or awry. American Academy of Dermatology. (2017). Psoriasis. American Academy of Dermatology. (2017). Rosacea. Ferri, Fred F. Ferri's Clinical Advisor 2008. 2008. Fred F. Ferri. Philadelphia: Mosby, 2008. Sankowski AJ, Łebkowska UM, Ćwikła J, Walecka I, Walecki J. Psoriatic Arthritis. Pol J Radiol. 2013 Jan-Mar;78(1):7-17.